mellificent goes trick-or-treating, dressed up as a butterfly. aet gives you 14 blue coffee-flavoured nuggets. algebrain gives you 5 pink grapefruit-flavoured gummy bats. columbina gives you 14 mauve mint-flavoured pieces of chewing gum. karen_d gives you 3 tan pineapple-flavoured gumdrops. melange428 tricks you! You lose 20 pieces of candy! miz_hatbox tricks you! You lose 5 pieces of candy! peebles tricks you! You get a block of wood. quiltingheart gives you 12 softly glowing blueberry-flavoured nuggets. shmuel gives you 12 light yellow coconut-flavoured pieces of chewing gum. xeney gives you 1 orange cola-flavoured wafers. mellificent ends up with 36 pieces of candy, and a block of wood. 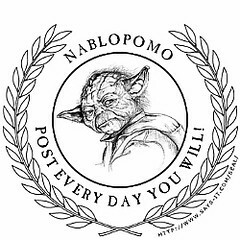 I am crazy (but we knew this already) - I signed up for NaBloPoMo - National Blog Posting Month. It's sort of a reasonable alternative to NaNoWriMo. I have to admit that I am not intending to hold myself to a terribly stringent standard for this, but I'm going to try. I'm thinking it can be sort of a warm-up for Holidailies - but on the other hand I don't want to burn myself out. In other words, I'm hoping for some sort of happy medium here.